Engraving by René Boyvin, 25.8 x 15.9 P (New York). Inscribed at bottom center: Peregrinus.Empedocles., and at the bottom right: Rous . Floren . lnuentor . / . B .
Robert-Dumesnil, VIII, 1850, 22, no. 12, as Boyvin after Rosso. Le Blanc, 1854-1890, I, 507, 179. Levron, 1941, 65, no. 5. COLLECTIONS: Florence, 7930ss. Florence, Marucelliana, Vol. LXX, no. 105. New York, 49.95.189. Paris, Ba 12; Ed 3; N 2 (505); SNR. Vienna, F.I.3, p.4, no. 9. Destailleur, 1895, 277, no. 1146. Kusenberg, 1931, 157, 160, as Boyvin after Rosso. Linzeler, 1932, 168. De Witt, 1938, 136 (with incorrect Uffizi number). Béguin, 1976, 77, 79-80, Fig. 68 (Paris). Carroll, 1978, 45, 49, n. 49. Borea, 1980, 262, no. 674. Forlani Tempesti, in Primato del disegno, 1980, 195, under no. 461. Carroll, 1987, 9, 37, 42, 44, 346, 348, under no. 109, 350-351, no. 110, with Fig. (New York). Carroll, 1989, 21-24, Fig. 39 (New York). 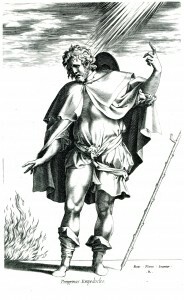 The engraving is based on Rosso’s drawing of Empedocles-St. Roch (Fig.D.80a) that is the same size but in reverse of the print and that has outlines gone over with a stylus, possibly made to transfer the figure to the engraver’s plate. The engraved figure shows a pilgrim’s staff incongruously placed to his side and has a band around his chest and shoulder to support his hat, features not in the drawing, but he does not have the pest mark of the drawn figure. The moon with its rays in the drawing has been replaced with fire in the print, and clouds and rays of light have been added above. Not in the print is the small diagram at the lower left of the drawing. Rosso’s authorship of the figure of Empedocles is guaranteed by the style of the drawing on which the engraving is based and by the inscription on the print. The changes that appear in the print would seem to have been made to present a more explicit iconography. Whoever invented these changes, it was someone knowledgeable in the thought of the presocratic philosopher. But the simplification of the iconography in the print suggests that the changes were not made or incorporated into the image by Rosso. It is likely that they were made after his death and specifically for the engraved reproduction of his image. 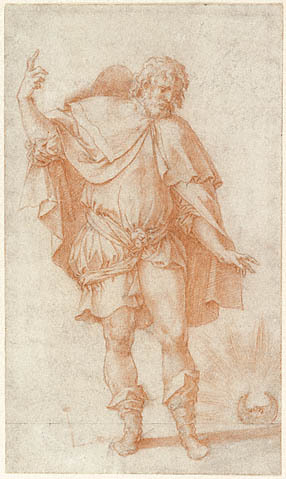 Rosso’s drawing seems to have been made in 1539 or 1540. The engraving was probably made in the 1550s when Boyvin’s prints after Rosso’s designs seem to have been executed, but before 1563 when it was copied as St. Roch, possibly by Gaspare Osello (see below). COPY, PRINT: E.106. Attributed to Gaspare Osello, St. Roch. Engraving, 25.2 x 15.6 S (Paris). In reverse of Boyvin’s print. Inscribed at the bottom center: . Rous . Floren . Inuentor . / . GA . F . 1563 . , and at the lower right: . NN exc . Robert-Dumesnil, VIII, 1850, 22, under no. 12, suggesting that GA . F refers to Osello as the engraver and NN to Nicolo Nelli as the editor (see also Nagler, Monogr., I, 1858, 944-945, under no. 2243). Le Blanc, 1854-1890, III, 122, 9, as Osello after Rosso. Kusenberg, 1931, 157, 160, 166, as Osello. Levron, 1941, 65, under no. 5, as Osello. Béguin, 1976, 79-80, Fig. 69 (Paris), as Osello. Carroll, 1978, 49, n. 49. Borea, 1980, 262, under no. 674, as Osello. Forlani Tempesti, in Primato del disegno, 1980, 195, under no. 461, as Osello. Carroll, 1987, 350, n. 1, under no. 110. Carroll, 1989, 23, Fig. 41 (Paris). 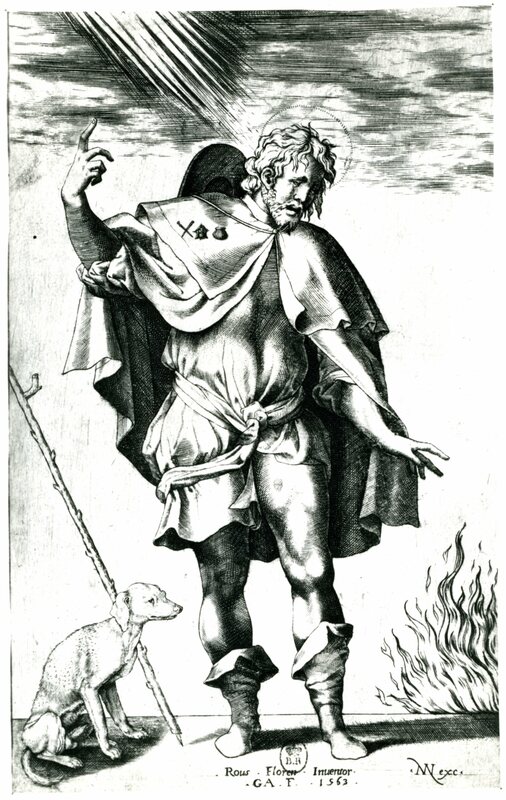 The print differs from Boyvin’s by showing the figure of St. Roch with three pilgrim badges on his cape and a pest mark on his left thigh; a seated dog, copied from and in reverse of the one at the lower right of Dürer’s St. Eustace (Bartsch, VII, 1808, 73, 57) is placed next to the staff at the left. There is a painting of St. Roch (canvas, 120 x 75 cm.) derived from Osello’s print in San Niccolò, Arezzo, without the fire, and with the staff shifted from behind the dog into the saint’s left hand (Moriondo, 1950, 31, no. 71, as by Teofilo Torri, from Arezzo, d.1623; Salmi, 1951, 189, Pl. LV, Fig. 228, as by A. Forzori).